Yeah you read that right...Pavement lights to help guide "smartphone zombies" across the road! Even the very thought of installing these so called pavement lights just makes my mind boggle. I am at the age that smartphones are supposedly at their most popular, and for me I just don't see how people can't put their phones away to even cross a road. It just seems that everyone nowadays is completely obsessed by their smartphones. Personally, I think something needs to be done to help people who have a genuine problem with addiction to smartphones and technology and pavement lights are not the answer. Pavement lights have been installed at a pedestrian crossing in a Netherlands town to help smartphone users cross the road safely. 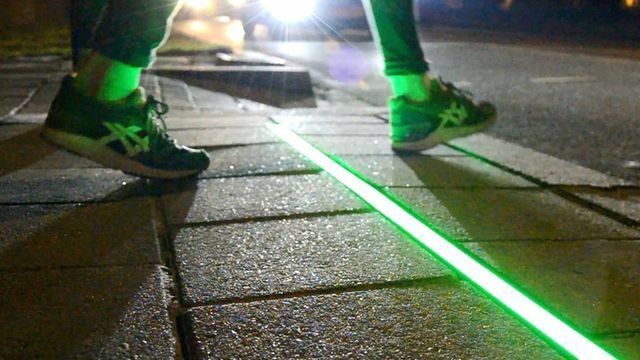 The light strips are designed to catch the eye of people looking down at their device, and change colour to match traffic signals.